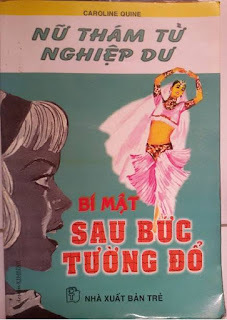 By some kind of dumb luck I stumbled across a Facebook post where a nice person in Vietnam posted the 4 covers of the series called "Nữ thám tư nghiệp dư" (female amateur private detective). I immediately recognized the Albert Chazelle covers from the French Hachette "Alice" books, which was then confirmed by the author's name on the books of Caroline Quine. Since Vietnam was a French colony until the 1950s it is not too strange that these editions call Nancy by her French name. The stories released by this publisher from1998-9 are Crumbling Wall (picture attached), Old Attic, Red Gate Farm and Leaning Chimney. I think they are probably paperbacks since I note some folds to the covers but don't know for sure. Is anybody out there in Vietnam who wants to help me acquire some of these editions?